In a kaizen workshop, you spend two to five days focusing on one particular process. The workshop generally involves training as well as the actually workplace kaizen improvements. In the video below, you will see one method of running a kaizen event or workshop. I enjoy looking at videos like this because it shows the different styles of the instructors and how they interact with the participants. In this particular workshop the teams each came up with a name and a funny team chant. As well, they do some dancing as a group, and if you look closely they appear to be following some video instructions. Probably a good way to introduce standardized work! During this kaizen workshop you get to see examples of error proofing or "poka-yoke." The teams also create some 5S shadow boards while they demonstrate how the parts will be kitted. A lean game or simulation is played by ripping pieces of paper and passing them along a line. I'd be interested in seeing some instructions for that game if anyone's tried it. I also saw a bunch of paper plates at one point. 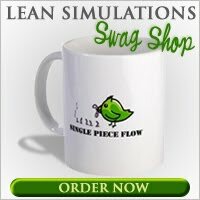 Maybe another lean game or perhaps just lunch preparations? It's always nice to see other people's kaizen workshops and activities, just to benchmark and learn from each other. This video is about 6 minutes and gives a decent summary of what it's like to be part of a kaizen event. And they claim a 50% cycle time reduction!